December 19th through December 30th from 7 to 10 pm. Dazzling tree lights, holiday music and more is all yours to enjoy during Zoo Lights at Zoo Miami. Admission is just $5.00. For more information visit zoomiami.org. Saturday, December 20th, starting at 7pm. This annual parade takes place along the Bel-Aire Canal in Cutler Bay. Residents can get a good view of the parade from the Marlin Rd bridge (at Bel-Aire Drive), or the foot bridge located at Bel-Aire Drive and Cutler Ridge Drive (near Cutler Ridge Park). See the map for locations. Saturday, December 20th, parade begins at 7pm, participants arrival time, 6:30 at Cutler Ridge Park. This 4th annual events features golf carts decorated for the holiday season. Come to watch or bring your decorated cart and join the parade, either way it's a fun holiday event for the whole family. Sunday, December 21st, 2–4pm. Celebrate Chanukah at Coral Reef Park. The event includes the lighting of a chocolate coin Menorah, with Dreidels, Donuts, music and a bounce house along with crafts for kids. The park is located at 7895 SW 152nd Street in Palmetto Bay. See the flyer for more information. December 19th, 7pm. Bring the kids to Zoo Miami for dinner with Santa himself. The event includes carousel rides, decorating cookies with Mrs. Clause, and more. Reserve now because space is limited. Visit zoomiami.org for more information. Thursday, December 11th, 6:30 pm. New student recruitment and campus tour night. Thinking about applying for admission to Cutler Bay's local Public High School, Cutler Bay Academy? Cutler Bay Academy offers innovative learning programs including iPrep Academy, COAST, and Liberal Arts Academies. Applications will be accepted until January 15th. For more information about how to apply, visit their website at bayacademy.org. Friday, December 12th, 7pm. Visit Cutler Ridge Park for a viewing of the movie “ELF”. Admission is free. For your comfort, bring lawn chairs and blankets. Snack food and drinks will be available for purchase. For more information see the flyer. Friday, December 12th. Get in the holiday spirit when Pinecrest Gardens presents “How the Grinch Stole Christmas”. Gates open at 6:30 with flashlight tours at 7:30 and 7:45. Movie begin at 8. General Admission is $5.00. For more information, visit their website. Saturday, December 13th, 3 to 7pm. Palmetto Bay will host their Holiday By The Bay event featuring music, rides, arts and crafts, Santa, and at 6pm SNOW. The event takes place at Ludovici Park, 17641 Old Cutler Road. For more information see their flyer. Beginning November 26th through January 3rd from 6pm – 9pm. Stroll through the gardens and delight in the view of over 60 different light displays. The event includes a rotating schedule of entertainment including pony rides, visits from Santa, and story time events. General admission is $5.00. For more information and event schedule, visit pinecrest-fl.gov. November 28th at 8am. 6th Annual Black Friday Balloon Drop. Thousands of ballons drop from the rafters at 8am in the Sears, JC Penney, Macy's Wings & Center Court filled with mall gift cars, store coupons, movie passes and more. The following events take place at Southland Mall. For more information visit mysouthlandmall.com. December 2nd, 7pm. The Concerned Citizens of Cutler Bay will be holding their end of the year Holiday social. This is an opportunity for residents to visit with neighbors and find out more about the organization and our upcoming events. The Concerned Citizens meet the first Tuesday of every month. Meetings take place at 7pm at the Cutler Ridge United Methodist Church, located at 20740 Old Cutler Road. For more information, visit ccofcb.org. Saturday, December 6th, Florida Rock Stars presents this 3rd Annual Food and Rock Festival at Ludovici Park in Palmetto Bay. The event includes great food, a cash bar, raffle, and great music from Cutler Bay's own “Cutler Stew”, along with Mr. Nice Guy, The Regs, and The Livesays. For advance discount tickets and additional information, visit their website at floridarockstars.com/miami-woodstock. December 6th, 11am – 6:30pm. Enjoy this annual Holiday Festival at Pinecrest Gardens. This family event includes food, carolers, live music, theater, train display, puppets, face painters, the lighting of the holiday tree and Santa himself. Admission is $5.00. For more information, visit pinecrest-fl.gov. Saturday December 6th at 4:00pm (Children's Choir) and 7:30pm (Orchestra). This annual musical event features an array of musical performances for an evening filled with the sights and sounds of the Christmas season. The concert takes place at the Old Cutler Presbyterian Church, located at 14401 Old Cutler Rd. Call 305-238-8121 or visit ocpc.org for more information. Residents are encouraged to donate today to their favorite charity. Donations of $25.00 or more will receive bonus funds from the Miami Foundation. While there are hundreds of great charities to choose from, we hope you will consider making a donation to the Tropical Audubon Society. For more information, visit the website by midnight tonight givemiamiday.org. November 16th- 23th, Street Fair November 2st- 23rd. This week long event features an array of author discussing their latest books, book signings, and other events culminating in a two day street fair. For advanced ticket sales and more information, go to miamibookfair.com. Saturday, November 22nd from 9am to 3pm (Registration ends at 2pm). South Dade residents are invited to attend a Comprehensive Free Health Fair conducted by the University of Miami Miller School of Medicine. The Health Fair takes place at Branches United Methodist Church, located at 129 SW 5th Ave, Florida City. Read the flyer for a list of services that will be provided and contact information. November 22nd and 23rd. Featuring handmade arts and crafts, live entertainment, car show, kids activities, Santa and much more. The event takes place at the Miami-Dade Fair Expo, located at 10901 Coral Way. Visit miamiharvest.com for tickets and more information. Saturday, November 22nd, 4pm. This annual parade at The Falls Shopping Center features marching bands, costumed characters, stilt walkers, a Junkanoo band, bag pipers, Dixieland band, and Santa himself. The festivities continue throughout the evening. For more information, visit simon.com. Saturday, November 22nd, 9:00am - 5:00pm. Featuring local craft vendors, homemade baked goods, rummage sale, hotdog & hamburger café, and silent auction. Fair proceeds will benefit: Habitat for Humanity, Lutheran Services of Florida, and St Thomas Homeless Ministry. St Thomas Lutheran Church is located at 17700 Old Cutler Rd. November 14th – 16th. Try delicious Greek food, traditional Greek dancing and music, along with rides for the kids. The fun takes place at St. Andrew Greek Orthodox Church, located at 7901 N. Kendall Drive. Phone 305-595-1342, or visit themiamigreekfestival.com for tickets and more information. Sunday, November 16th from 10am-6 pm. Visit the Fruit and Spice Park for their Fish Fry and Seafood Festival. Enjoy live music and kid-oriented activities. Admission is $8.00 for adults, and free for children 11 and under. For more information, call 305-247-5727 or visit fruitandspicepark.org. The park is located at 24801 SW 187th Ave. Homestead. Friday, November 7th through Sunday, November 9th from 9:30am–4:30pm. This 74th annual event includes more then 15,000 plants for sale, live music, antiques and collectibles, old and rare books and an art marketplace. Enjoy a Farmer's Green-market, tea garden, beer tasting garden, a science trail, lots of food vendors, and Kid Way, with face painting, live performances, games and more. The event takes place at Fairchild Tropical Garden, located at 10901 Old Cutler Rd. Call 305-667-1651 ext. 3344. For additional information, visit fairchildgarden.org. Saturday, November 8th from 9am - 4pm. Cutler Ridge United Methodist Church will hold their annual Country Fair and BBQ. Join the fun at this annual event including music, free rides for the kids, and indoor craft display and vendors. Enjoy a chicken diner with baked beans, corn on the cob, and soda for just $6.00 or 2 for $10.00. There is also a hotdog lunch, homemade cinnamon buns, baked goods and more. CRUMC is located at the corner of Marlin Road and Old Cutler Road. November 1st, 10:00am – 6:00pm. Holy Roasary-St Richard Catholic Church will present their first Annual Food and Arts festival. The event takes place at 7500 SW 152nd Street, in Palmetto Bay. Saturday, November 1st and Sunday, November 2nd. Visit Fairchild Garden for their plant show and sale presented by the South Florida Palm Society. A large selection of palms will be available for sale. Visit their website for more information. October 24th, 25th and 31st from 7pm – 11pm. Visit Zoo Miami for a spooky night of fun including Dr. Wilde's Creepy House, spooky tram rides, ghoulish carousel rides, chilling story-telling and more. Visit the zoomiami.org for more information. Saturday October 25th, 11am - 1pm. Kids ages 3-11 will have a spooky good time with free candy, a scavenger hunt and a costume contest. First prize - $150.00, second $100.00, and third $50.00. The shopping center is located at 20425 Old Cutler Road. Saturday, October 25th from 5pm to 7pm. Kids 12 and under can enjoy games, crafts, tattoos, and a costume contest with prizes. Then on Friday, October 31st, from 4pm -6pm, visit the fountain area by TJ Max for free goodie bags. Both events takes place at Southland Mall, located at 20505 South Dixie Hwy. For more information visit mysouthlandmall.com. Saturday, October 25th from 9am-5pm and Sunday, October 26th from 11am-3pm. Don't miss Tropical Audubon's plant sale where you can choose from a variety of indigenous South Florida plants. Native plant experts will be on hand to help you decide the best choice for your yard. Audubon members-only pre-sale on October 24th. The event takes place at 5530 Sunset Drive. See their Facebook page for more information. October 25th from 6-9pm. The Gold Coast Railroad presents a family fun event with haunted train rides, monster movies, trick or treat stations, food concession stands, and more. Admission is $10.00, train rides are an additional cost. For more information or to pre-order tickets, visit their website at gcrm.org/. The museum is located at 12450 SW 152nd Street. October 25th, 11am. The South Miami-Dade Cultural Arts Center presents Dino-Light, a dazzling tale about a dinosaur presented using puppetry, technology, and dance. Tickets are $10. For more information, visit their website at smdcac.org/events/dino-light. October, 25th and 26th from 9:30am to 4:30pm. The Florida Nursery Growers and Landscape Association (FNGLA) will host their first annual plant market at the Montgomery Botanical Center, located at 12595 Red Road, Coral Gables. The event will include plant sales and guided tours. $5.00 admission. Visit their event page for more information about the event. Sunday, October 26th, from 9:30 am until 4:30 pm. Visit Fairchild Garden and enjoy viewing more than 100 vintage cars. For more information, visit fairchildgarden.org. Sunday, October 26th, 4pm. The Children's Trust presents a free concert featuring The Greater Miami Youth Symphony and the Alhambra Orchestra. The event takes place at The Olympia Theater at The Gusman Center for the Performing Arts, 174 East Flagler Street, Miami. No tickets required. For more information, visit their website. Wednesday, October 29th, from 6-9pm at Cutler Ridge Park. Experience the terror of the haunted house, the adventure of the spider egg hunt, the costume contest, good food and great fun. Don't miss "Track or Treat" Cutler Ridge Park is located 10100 SW 200th St. Call 305-284-4166 for more information, or read the flyer. October 31st, from 9:30am to 4:30pm. Bring your dog to Fairchild Garden for a day of four-legged fun, including a chance to show off their costumes, and a doggy tram ride. For more information, including rules for attending with your dog, visit fairchildgarden.org. Audio Recordings of Town Council Meetings - Now Available On-Line. Residents can now listen to the audio recording of Cutler Bay town council meetings and workshops. You can listen to the full recording or click on subjects of interest such as a specific ordinance being considered, town manager's reports, public comments, etc.. Audio recordings are not live but are available a few days after the meeting at cutlerbay.legistar.com/calendar. Local residents and commercial building owners wishing to finance hurricane and home energy improvements can now finance these improvements through the PACE (Property Assessed Clean Energy) program. This program allows homeowners to finance these improvements and pay back the costs over a period of up to 20 years as part of your property tax bill. Eligible improvements include: Insulation, Renewable Energy systems, Window and Door replacements, HVAC Systems, Lighting systems and wind resistance. Visit the Ygrene website for more information. Sunday, October 19th from 7:30am – 11am. Visit the Deering Estate for a guided canoe tour of Biscayne Bay. Visit Chicken Key, a seven-acre island filled with mangroves, birds, sand dunes surrounded by seagrass beds, and a variety of wildlife. For more information, visit their website. October 17th, 8pm. Join the non-living for a night of music, great food and drinks, a zombie re-enactment of Michael Jackson's “Thriller” and a visit to the haunted house (if you dare). It all takes place at Zoo Miami. For more information visit their website. October 18th, from 9am – noon. Amscot and the Cutler Bay Police will be hosting their annual free bike helmet give-a-way for children. Amscot is located at 19353 South Dixie Hwy. For additional information, see their flyer. October 18th, 9am–3pm. Just in time for the Holidays. Visit Christ The King Church for their White Elephant Sale and Bazaar featuring art and music collectables, holiday crafts and much more. The church is located at 11295 SW 57th Ave., in Pinecrest. For more information, visit ctkmiami.org. Saturday, October 11th, 7:30 – 10:30pm. The Deering Estate presents fine wines and food at their Annual Wine on Harvest Moon celebration. This years event features the wine and food of Germany, along with live entertainment, and an art exhibit. Tickets can be purchased online. For additional information, visit deeringestate.org. .
Wednesday, October 15th, from 7 – 9pm. Visit the Deering Estate for the reception of the Fall Fine Art Exhibit Wunderbar. This event is free and open to the public. Light refreshments will be available along with a cash bar. For more information, visit deeringestate.org. Thursday October 2nd through Sunday, October 5th, 9:30am - 4:30 pm. Visit Fairchild Tropical Garden for their Bird Festival and birding tours to South Florida bird habitats. The Thursday and Friday events takes place off-site with birding tours around South Florida led by the Tropical Audubon Society. Saturday and Sunday's events at Fairchild include presentations by experts, bird walks, and a bird-attracting plant sale. For more information including lecture dates and times, visit fairchildgarden.org..
October 7th, 7pm at Cutler Ridge United Methodist Church. The Concerned Citizens of Cutler Bay will host their final candidate forum for the Nov 4th election. All Cutler Bay candidates for the positions of Mayor and Seat 1 have again been invited. At last month's event, candidates Peggy Bell and Mary Ann Mixon did not participate. Neither responded to email invitations or emailed requests to confirm their participation. Read CCofCB president Steve Zarzecki's letter on page 7 of the Cutler Bay News. For more information about the Concerned Citizens of Cutler Bay, visit their website at ccofcb.org. At the August 20th council meeting, Mayor Ed MacDougall sponsored a resolution to stop development on 88 acres of rock pinelands located on SW 152nd Street and Southwest 127th Ave. Although not in our town, the hope is that other communities will follow suit and protect this piece of environmentally sensitive land that was given to U of M and then sold by them to a developer. To read more about the Mayor's resolution, see item 7A on the town's agenda and click on the links. The detour on Caribbean Blvd has been extended to include Franjo Road. This phase of the Caribbean Blvd road improvements is scheduled to be completed in mid-October. See the map for details of the closure and detour routes. Effective Sunday, August 17th, Miami Dade Transit will be making adjustments to several bus routes including the Cutler Bay Local, Route 70, and other routes that may affect your commute. Please visit miamidade.gov/transit for information about which route will be effected and what changes will be taking place. Saturday, September 27th, 7pm. Start Off Smart, a non-profit family violence support service, will be having a masquerade ball at the Miami Marriott Dadeland. The event includes cocktails, a sit down dinner, live band, silent auction and a performance by the Florida Grand Opera. Early bird tickets are available through August 31st, For more information, visit their website at sosmasquerade.com or phone 305-224-5585. Saturday, September 27th, from 8:30am - 3:30pm. The Good Government Initiative is offering a one day workshop for citizens who want to learn strategies for advocating for an issue with their local government. Space is limited to 40 applicants. Cost of the workshop is $25.00 and includes breakfast and lunch. For addition information, visit goodgov.net. Tuesday nights, beginning September 16th. Join a team and join the fun. Registration ends on September 12th. Players must be 21 or older. See the flyer for more information. September 18th-21st. Proceeds benefit the Diabetes Research Institute and the Key West Sunrise Rotary Club. For more information, visit petersonsharley.com. Saturday, September 20th. Help keep Miami-Dade beaches and park areas clean. The closest clean up locations to Cutler Bay are Blackpoint Marina and the Deering Estate. For more information, and to register as a volunteer, visit miamidadecoastalcleanup.org. Saturday, September 20th, from 10am to 4pm. Visit the Deering Estate during their Fee-Free “P.L.A.Y” Days and enjoy free admission. tropical fruit display, scavenger hunt, and a tug-o-war. There will also be a rain barrel & water workshop, food and beverages will be available for purchase. For more information, visit their website at deeringestate.org. September 9th, 7pm. The Town of Cutler Bay will hold the first of two budget hearings (The second meeting takes place on Aug. 20th). The budget calls for reducing the property taxes (millage rate) to what is known as the roll back rate. The roll back rate (2.3907) is the amount that will provide the town with the same revenue as last year. The current rate is 2.5702. The executive summary outlining changes in this budget compared to last years, begins on page 7 of the agenda. Thursday, September 11th, 9am. Join the Miami Dade Police Department and Fire Rescue at their 13th Annual 9-11 Ceremony. This solemn event takes place at Tropical Park, 7900 SW 40th Street. For information, visit poat.org. Saturday, September 13th from 9am – 3pm. Volunteers are needed to help plant native grasses and seedlings for this Cutler Bay coastal habitat restoration project. Participants will meet at the property located on 184th Street and Old Cutler Road, just south of the Palmetto Bay Village Center. To find out more about the project or to find out how to sign up as a volunteer, visit regionalconservation.org. To read more about the history of this property and how it was saved from development by local residents, visit livablecutler.blogspot.com. September 18th, at 6:30pm. Miami-Dade Public Schools will hold a public meeting to consider changing the name of our new high school. See the following notices for the Cutler Ridge Campus and the Centennial Campus. On Tuesday, September 2, from 7 to 9 PM, the Concerned Citizens of Cutler Bay will hold a Candidate Forum for candidates running for Cutler Bay Town Council. This includes Peggy Bell and Art Nanni running for Mayor, and Mary Ann Mixon and Ed Wolmers running for Seat One. The candidates will answer questions and discuss important issues. The forum will be held at the Cutler Ridge United Methodist Church, 20740 Old Cutler Road, Cutler Bay. For more information about the Concerned Citizens of Cutler bay, visit ccofcb.org. Wednesday, September 3rd, 6:30pm to 9:00pm at Fairchild Garden. Learn the basics of vegetable gardening in South Florida including composting, raised beds, and pest and disease prevention. Cost for non-members is $45.00. For more information, visit fairchildgarden.org. On August 5th, The Concerned Citizens of Cutler Bay hosted a debate with District 8 County Commission candidates Lynda Bell and Daniella Levine Cava. You can watch the video of the debate. Get information, including candidate websites for the August 26th primary election, on our primary election page. Saturday, August 16th, from 10am to 4pm. Visit the Dearing Estate during their Fee-Free “P.L.A.Y” Days and enjoy free admission. Hands-on science activities and historic house tours are also free. Food and beverages will be available for purchase. For more information, visit their website at deeringestate.org. Early voting has started for the August 26th primary election. For a list of candidates, links to their websites, and other information, visit our primary elections page. For a list of voting locations and times, visit miamidade.gov/elections. Friday, July 25th at 12:00 noon, through Friday, August 8th at 12:00 noon. Anyone interested in running for either Mayor, District 1 or District 3 must file qualifying paperwork with the Cutler Bay Town Clerk, Debra Eastman, prior to August 8th at 12 noon. If you, or someone you know is interested in running for any of the above positions, please contact the clerk's office. The following is for informational purposes only and should not be considered complete nor substituted for discussing your candidacy with the town clerk well in advance of the August 8th noon deadline. See the Mayor and Council pay and benefits package, map of council districts, and the town charter..
Thursday, August 7th and Friday, August 8th at 2:00 pm. The Town of Cutler Bay will be conducting additional meetings in their efforts to update the town's Strategic Plan. The August 7th meeting takes place at Saga Bay Apartments, located at 21215 SW 85th Ave.(map). The August 8th meeting takes place at Coral Bay Terrace, 8160 SW 210th St.(map. See the flyer for more information. At the March 14th council meeting, Mayor Ed MacDougall sponsored a resolution which has resulted in exposing mismanaged County GOB funds. The resolution, which passed 4 to 1, requested that the County review GOB funding for a building that was constructed on the former Bay Point School property, located at 22025 SW 87th Ave. (Councilmember Peggy Bell was the lone dissenting vote against the resolution). The result of that resolution was a County audit exposing that the majority of the taxpayer funds were distributed after the school was shut down in 2009. The unused building is currently vacant. For more information, read the Miami Herald article, the town resolution, and the audit report. Funding has been approved by the Board of County Commissioners, for improvements on Caribbean Blvd. from Coral Sea Road to the C-100 canal bridge. These improvements are expected to cost $2,663,805 with the majority of the funds coming from the County, along with $726,451 from town funds. These improvements, along with plans to widen the C-100 canal and improve the bridge, will complete the roadway improvements along Caribbean. For more information, read the county resolution. You can also view a presentation of the upcoming C-100 Canal bridge improvements and the ongoing Caribbean Blvd improvement project. 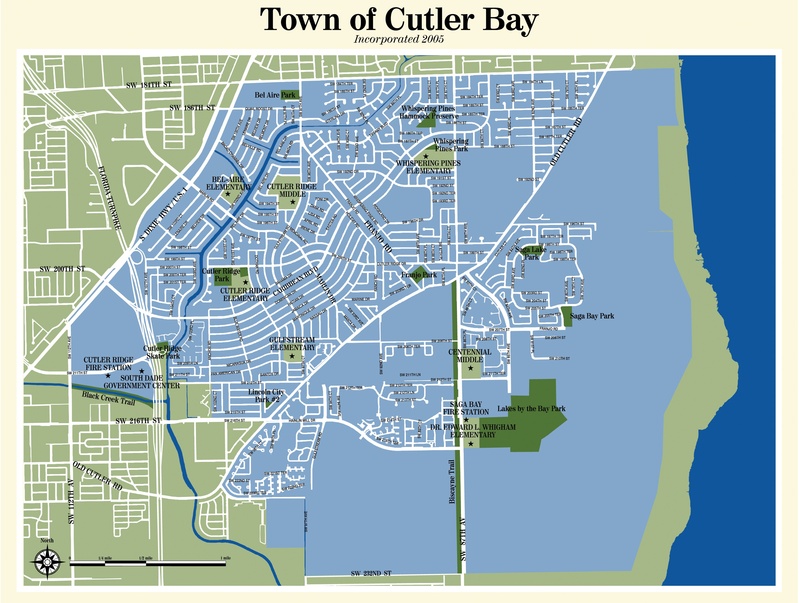 The Town of Cutler Bay provides a portal to zoning information, maps and other useful information at tcbgis.cutlerbay-fl.gov. Cutler Bay properties values increased this year at a higher rate then nearby communities. New construction is up this year and will provide additional revenue for the town. See the summary below or see the preliminary certified tax roll released by the property appraisers office on July 1st. Cutler Bay Ranked #7 of "Cities on the Rise in Florida"
Consumer advocacy site NerdWallet, has ranked Cutler Bay #7 of "Cities on the Rise in Florida". The study crunched population, employment and income growth data. Read the article for more information. Saturday, August 2nd, and Sunday, August 3rd, from 9am – 3pm. Volunteers are needed to help with a joint Palmetto Bay / Cutler Bay coastal habitat restoration project. Participants will meet at the Palmetto Bay Village Center where they will help plant native grasses and seedlings. To find out more about the project or to find out how to sign up as a volunteer, visit regionalconservation.org. Friday, August 1st – Sunday, August 3rd. Florida residents can purchase clothing, footwear, school supplies, computers and other items tax free during the state's tax free holiday. See the flyer for more information or visit the Florida Department of Revenue website. Kids and teens,18 years old or younger can receive a free meal this summer at participating locations throughout South Florida. For information about the program, visit summerfoodflorida.org. Be sure to click on the “Find a site near you” for an interactive map where you can locate and click on the link for the nearest site to get information about start dates, meal(s) served, times and address. The FCAT scores have been released. In the graph below, you can see how Cutler Bay Academy 10th grade students scored compared to other area high schools. For information on other schools. visit the Florida Department of Education website. Beginning June 9th through August 15th, children ages 18 and under can receive a free lunch at their local library on select days. Meals are served on a first come, first served basis. For more information including participating locations, and lunch schedules, visit their website. While viewing the free lunch schedule, click on the name of your local library branch to discover a list of fun and educational events taking place for both kids and adults. Saturday, July 26th, 8pm – 10pm (gate opens at 7pm). Visit the Deering estate for a concert featuring Davis & Dow. The event takes place in the historic Stone House Ballroom. Tickets are $20. Advanced tickets are recommended. To more information, visit their website. Saturday, July 26th from 9am to noon. The Miami-Dade Adopt-A-Tree program will be having a tree give-a-way at the Harris Field Pavillion in Homestead. Participants with a valid picture ID may adopt 2 free trees per year. Tree species available are: Mango, Black Mulberry, Jackfruit, Starfruit, Orange Geiger, and Inkwood. For more information about the event, the trees or a map to Harris Field, visit miamidade.gov/environment/adopt-a-tree. Sunday, July 27th. Young and old are invited to participate in an event where 100% of the proceeds help find a cure for Huntington Disease. This early morning event takes place at Larry & Penny Thompson Park. Visit huntingtonsdiseasefl.org for more information. July 21st – July 26th. Southland Mall celebrates kids week with a variety of kid friendly events. For specific times, locations and additional information, visit their website at mysouthlandmall.com. Sunday, July 20th, from 10am to 4pm. Visit the Dearing Estate during their Fee-Free “P.L.A.Y” Days and enjoy free admission. Hands-on science activities and historic house tours are also free. Food and beverages will be available for purchase. For more information visit their website at deeringestate.org. The town council approved the application for a new El Dorado Plaza in Cutler Bay, opening in Spring 2015. The furniture store and shopping plaza will be located at 19250 South Dixie Highway. See the flyer showing the project and additional information. The qualifying period for residents interested in running for a seat on the Town Council will open on Friday, July 25th at noon and end on Friday, August 8th at noon. If you are interested in running for the position of either Mayor, District 1 or District 3, you are urged to contact the Town Clerk's Office for information on how to run. General information can be found on the town's elections page. See the map of council districts and a breakdown of salary and benefits that the council receives. Saturday, July 12th and Sunday July 13th, from 9:30am-4:30pm. Fairchild Garden presents their International Mango Festival celebrating the "Mangos of Colombia". The event features, tree sales, lectures, cooking demonstrations, fresh fruit market and smoothies, Mango Brunch, and activities for kids. For more information, visit their website at fairchildgarden.org. Wednesday, July 9th at 7pm. The Town of Cutler Bay is updating it's Transportation Master Plan. If you missed the opportunity to weigh in at the recent Concerned Citizens Meeting, the town will be conducting two public input meetings for residents to give suggestions, express concerns, and have questions addressed on all transportation related issues. For meeting dates, locations, and more information see the press release. The Whispering Pines Civic Association and the Whispering Pines Woman's Club, along with the Town of Cutler Bay will sponsor the 47th annual Fourth of July Celebration at Whispering Pines Park, located at SW 88th Court and Ridgeland Drive (map). A parade featuring decorated floats and bicycles begins at 9:00 am. This event is free and open to all residents of Cutler Bay. For more information, call 305- 238-4166 or see the flyer. July 4th, beginning at 9pm. Celebrate our independence with a free fireworks show at Black Point Marina. Bring your lawn chairs, and picnic baskets or visit the Ocean Grill Restaurant on site. Don't forget the mosquito repellent. Come early as there will be no entering or exiting during the show and there is sure to be a crowd. The Marina is located at 24775 SW 87th Ave. See the flyer for more information. For a map of the location and more information about the marina, visit our parks page. June 7th through July 19th. Children, teens and adults are encouraged to spend the summer reading a great book, and with Miami-Dade's library's summer reading program, you can win great prizes just for reading. To find out more about the program, visit mdpls.org. June 21-22nd from 10am-5pm. Visit the Redland Fruit and Spice Park for this annual event showcasing local agriculture and wines, tropical fruits, and rare fruit samplings. The Park is located at 24801 SW 187 Ave. Admission is $8 for adults, and is free for children 11 and under. Phone 305-247-5727 for additional information, or visit their website at fruitandspicepark.org. Starting May 26th, the Florida Department of Transportation (FDOT) will begin roadway construction on US-1 from north of SW 184th Street to south of SW 112th Ave. This work, which will effect both Cutler Bay and Palmetto Bay, includes repairs to sidewalks, curbs and gutter, repaving and re-striping, upgrading traffic lights, landscaping and more. The construction is expected to continue through November 2014. For lane closure, detour and other information, see the flyer. Beginning June 5th, construction on Caribbean Blvd will expand to include the intersection at Holiday Road. Read the flyer for traffic detour information. Saturday, June 14th, 11am through 9pm. Visit Cauley Square for their 1st Annual Veterans Music and Art Benefit Festival. Enjoy music, food, arts and crafts while helping a good cause. All proceeds go to the Florida Veterans Foundation. Admission is $5.00. For more information, visit cauleysquare.com. Cauley Square is located at 22400 Old Dixie Hwy. June 16th, 7pm @ Cutler Ridge Park. This is the last of four town hall meetings that the town will be holding to get public input into the future direction the town should take in the next few years. The information and opinions gathered at these meetings will guide the council to create a plan and the steps they need to take to implement this plan. Your participation is not only wanted but needed to ensure the future direction of Cutler Bay. See the flyer with meeting dates, times and locations and how to participate if you can not attend a meeting. You can also view a presentation showing the 2006-2011 strategic plans goals and achievements. June 9th – August 15th. Children ages 6-13 can participate in Cutler Bay's Summer Camp Program. Contact the Parks and Recreation Department at 305-238-4166 for more information. Click here for a registration form with cost information. Tuesday nights, beginning June 3rd. Join a team and join the fun. Registration has already begun for the adult, co-ed Kickball League at Cutler Ridge Park. Players must be 21 or older. See the flyer for more information. Registration Begins April 28th for Summer Swim Classes at Cutler Ridge Pool. Registration is on a first come, first served basis. For class start dates and cost per child, see the flyer which also includes summer public swim hours in effect from June 9th through August 15th. Tuesday, June 3rd, 7pm. The June meeting welcomes the Town of Cutler Bay’s Public Works Department and the Corradino Group for an open discussion about changes to the town's Transportation Master Plan. Your ideas and input could make a difference. The Concerned Citizens meet at Old Cutler United Methodist Church, located at 20740 Old Cutler Road. Thursday, May 29th through June 1st. Join fishing enthusiasts as they compete for up to $20,000 in cash prizes. The weekend event kicks off Thursday, May 29th, with dinner at the Captain's Party; the fishing competition takes place on Saturday, May 31st with the festivities concluding on Sunday, June 1st with an awards ceremony, food and fun. For more information, visit bluewaterfishingclassic.com. May 31st – June 8th. Hurricane season begins June 1st, get prepared and save money when purchasing your supplies during the State of Florida's tax free holiday. See a list of items exempt from the state sales tax. Sunday, June 1st from noon to 4pm. It's time to “flashback” to the 1970's for a groovy day of fun in the pool. Cool music, combined with food and beverages available for purchase. Special entrance fee and cheap prices for those willing to admit they were born before 1970. See the flyer for more information. Thursdays, 9am beginning May 15th. Adults 60 and older, learn the basics of how to use a computer by attending this hands-on program taking place at Cutler Ridge Park, located at 10100 SW 200th Street. To apply for the class, call 305-238-4166 or visit the park. See the flyer for more information. Thalatta Park in Palmetto Bay has recently been the subject of questions regarding the use of the park as a private wedding venue and the limited access granted to residents. Apparently the state, which provided funding for the park, is now asking for changes concerning the park's usage. Read more about it at the following blogs: eugeneflinn.blogspot.com and southdadematters.com. For more information about Thalatta Park, visit our Parks page. Friday, May 30th, 7pm. Join your friends and family for a free outdoor showing of the movie “Cloudy With a Chance of Meatballs 2” at Lakes by the Bay Park. Bring your lawn chairs and blankets. Concession food and drinks are available for purchase. Lakes by the Bay Park is located behind Whigham Elementary School, at 8551 SW 216th Street. See the flyer for more details. Wednesday, May 28th, at 7pm. This free event features Dr. Deron Burkepile, Assistant Professor, FIU Department of Biological Sciences. Dr. Burkepile will discuss the future of coral reef ecosystems. For more information, visit. This event takes place at the Deering Estate, located at 16701 SW 72nd Ave.
Sunday, May 25th, 8am. Thalatta Park will be the site of a 3 hour guided kayak tour. Learn about how mangroves are an important part of our eco-system while enjoying the beauty of Biscayne Bay. For more information, read the flyer. May 18th, 10am – 1pm. Remember Orchid Jungle? This hiking tour explores the original trail and greenhouses of the old Orchid Jungle property. The adventure then moves to Camp Owaissa Bauer for lunch and a hike through the pine land trail and crawling through the limestone caves. $5.00 per person. Read more about the hike, what to bring, where to meet and how to register by visiting castellowhammock.wordpress.com/. Sunday, May 18th, 1:00 pm to 3:00 pm. After learning about the history of cane pole fishing, participants will learn how to set up a cane pole, what types of baits you should use, and what type freshwater fish you can expect to catch. Then it's poles in the water to try your luck at catching your own fish. Cost for the clinic is $10.00. The event takes place at the Bill Sadowski Preserve, located at 17555 SW 79th Ave. Palmetto Bay. For more information, visit miamidade.gov/wps/Events. For a map to the park, website link, and more visit our parks page. May, 18th from 9:30am to 4:30 pm. Car enthusiasts will enjoy Fairchild's “Cars In The Garden” event featuring more than 100 cars including antique cars, Corvettes, and more. Visit their website for more information. Tuesday, May 6th, 7pm. The Concerned Citizens of Cutler Bay will host the Miami-Dade Commission of Ethics as they present a campaign skills seminar for South Dade candidates, volunteers and interested community members. The event takes place at the Cutler Ridge United Methodist Church, 20740 Old Cutler Road. See the flyer for more information. Just a reminder that Cutler Bay will be having elections for Mayor, District 1, and District 3 in November. (See District Map). Cutler Bay's Qualifying Period is from July 25th through August 8th, but interested individuals do not need to wait until July to begin their campaign. Be sure to attend the above meeting and speak to the town clerk for further information. May 11th, 10:30 am to 1:30pm. Visit the Deering Estate for their annual Mother's Day Brunch. Enjoy great food in a beautiful setting. For more information, visit deeringestate.com. Beginning April 17th, construction on Caribbean Blvd. will expand to include additional work areas. Caribbean Blvd will be closed to traffic from Bluewater Road to Holiday Road, with traffic being diverted onto Dominican Drive. See the map for more information. Residents may remember the town council last year approved a new shopping center on property owned by GFC Investments and known commonly as the potato field (Old Cutler Road at Marlin).The project, which included a Publix supermarket, has been delayed due to pending lawsuits. Publix has now paid $11.3 million to buy most of the land. For more information, visit bizjournals.com. Wednesday, April 30th, 6pm – 8pm. Miami-Dade is developing a long range transportation plan. Give your input on proposed improvements by attending this public meeting taking place at the South Dade Regional Library, located at 10750 SW 211th Street. For more information or the date and location of additional meetings, visit their website. May 2nd,7pm; May 3rd, 3pm (sensory friendly Performance) and 7pm and; May 4th 3pm. Visit Pinecrest Gardens for a performance of this family friendly favorite, presented by the Miami Children's Theater. For tickets and additional information, visit their website. Pinecrest Gardens is located at 11000 SW 57th Ave., in Pinecrest. Saturday, May 3rd, from 8pm-11pm. Visit the zoo for a chance to sample over 100 kinds of beer from around the globe. Live performance by Vanilla Ice. Tickets are $35 through April 6th, $40.00 through May 2nd, and $50 at the door. VIP admission is available at an additional cost. For advance tickets and more information, visit miamimetrozoo.com. The Zoo is located at 12400 SW 152nd Street. Saturday, May 3rd, 10am – 5pm. This kid friendly event features live performances by dancers and musicians, includes magic shows, art projects, free giveaways, face painting, and more. Visit their website for more information at smdcac.org . The event takes place at the South-Dade Cultural Arts Center, located at 10950 SW 211th Street. Saturday, April 26th and Sunday, April 27th from 1am to 4pm. Enjoy green activities and entertainment and the world's largest flowering tree plant show and sale. Turn in an old cell phone and come in free of charge. Sunday, April 27th, 4pm to 8pm. Michael Grunwald, award-winning author of “The Swamp”, will be the keynote speaker of this annual event which also includes food, drinks and live music, and a silent auction. Find out more about the event and about Tropical Audubon by visiting their website at tropicalaudubon.org. Sunday, April 27th, 11am – 4pm. Pinecrest Gardens will present their Earth Day Festival featuring Eco-Friendly workshops, Green Vendor Booths, Plant Exhibits, Wildlife Shows, a special performance by the Miami Youth Symphony, and their weekly Farmer's Market. Pinecrest Gardens is located at 11000 SW 57th Ave. Pinecrest. Visit their website for more information. April 25th, 7:30pm. Palmetto Bay will be celebrating Earth Week with a viewing of the movie “Frozen” at Coral Reef Park. Bring your blankets and lawn chairs and enjoy the show. Food and beverages available for purchase. Arrive early and watch the Lady Bug Release in the Meditation Garden at 7pm. For more information, visit palmettobay-fl.gov. Friday, April 25th, 5pm to 8pm at Pinecrest Gardens. The CLEO institute will be holding a climate science briefing and discussion from 5-6pm on climate change moderated by US Senator Sheldon Whitehouse (Rhode Island), followed by a “climate action rally”. The event is free but due to limited seating, a ticket is required. For your free ticket and additional information, visit the CLEO institute's website at cleoinstitute.org. Saturday, April 26th, registration begins at 10:30am. The Town of Cutler Bay and the Village of Palmetto Bay celebrate Earth Week with a 10 mile escorted bike ride and barbeque. There will be free helmets and free food for participants. The event begins and ends at Lakes by the Bay Park, 8551 SW 216th Street. For a map to the park, visit our parks page. See the flyer for more information about the event. Saturday, April 26th, 9am – 5pm. Celebrate spring at the St. Thomas Lutheran Church's Spring Fair featuring local crafts, baked goods and a rummage sale. Proceeds of the event will benefit Camillus House, Habitat for Humanity, and Luther Spring Camps. St. Thomas Lutheran Church is located at 17700 Old Cutler Rd. According to this Miami Herald article, the Palmetto Bay Council approved a charter school to be built on vacant property on Franjo Road and 180th Street (map). The school will serve up to 1,400 pre-K through 12th grade students and is part of a larger project that will include 80 residential units, a 353 space parking garage, and a commercial complex. The Miami Herald also reports that the school will be a part of the Somerset Academy franchise, managed by a company called Academica. Our State Representative, Erik Fresen, sponsored the legislation that limits the control that municipalities have over charter schools. Fresen works for a firm that has designed several charter schools for Academica, and his sister and brother-in-law run Academica. In 2006 residents and town officials in Cutler Bay and Palmetto Bay began advocating for the preservation of local coastal wetlands. These efforts resulted in the 2010 purchase of 129 acres of wetlands, located at SW 184th ST and Old Cutler RD, by the South FLorida Water Management District. Thanks to a $75,000 grant obtained by The Institute for Regional Conservation and National Park Service, the process of restoring several local properties will soon begin. Read more about the grant and how you can become a part of the restoration effort by visiting livablecutler.blogspot.com. You can also see the presentation that was given at the January Cutler Bay Town Council meeting. Wednesday, April 23rd, from 5-8pm. Have a great meal while supporting a great cause. Chipotle Restaurant, located at 19150 S. Dixie Hwy., will donate 50% of the proceeds from your purchase to the Tiger Sharks Booster Club at Cutler Bay Academy High School. Just bring in this this flyer or tell the cashier that you support Cutler Bay Academy. Saturday, April 19th and Sunday April 20th, 11am to 4pm. Kids 12 and under will have a great time at Zoo Miami, with continuous “egg safaris” activities and Mr. Easter Bunny himself. See their flyer for more information. Sunday, April 20th, 10:30 to 2:30. Celebrate Easter Morning with a special Easter Sunday Brunch Buffet. Delicious food, and the Easter Bunny too. See the flyer for buffet menu and price information. For reservations and additional information, visit fairchildgarden.org. The Miami Dade Expressway Authority (MDX) is a non-elected board who has been given the authority to raise tolls and issue bonds. Please sign this petition asking the Florida Legislature to hear House Bill 353 and Senate Bill 772, limiting their authority. House Bill 353 information and text. Senate Bill 772 information and text. April 5-19th. The Easter Bunny takes Center Court at Southland Mall. It's the perfect opportunity for kids to get their picture taken. Go to mysouthlandmall.com for hours and information on other April events. April 18th, movie begins at 8pm, happy hour begins at 6:30. Pinecrest Gardens presents "National Lampoon's Animal House" (R). Come early to enjoy a stroll through the gardens or a glass of wine. General admission is $5.00. For more information, visit pinecrestgardens.com. Pinecrest Gardens is located at 11000 Red Road, in Pinecrest. Friday, April 18th through Sunday April 20th. The Mami Seaquarium presents a day of continuous egg hunts, an Easter parade, rides, slides, bounce houses, dolphin shows, and of course, Mr. Easter Bunny himself. Find out more by visiting their website at miamiseaquarium.com. Saturday, April 19th, 10am. Kids 9 and under are invited join the fun of hunting for eggs, including special eggs for special prizes. There will be a bounce house, music with Ivan The DJ., and The Miami Balloon Guy. For the first 100 children, a framed 4x6 picture with the Easter Bunny himself. Parents are free to bring a camera and take a picture of their child with the Easter Bunny at no cost. Cutler Ridge park is located at10100 SW 200th Street. See the flyer for more information. Saturday, April 19th, from 10am to noon. Free Candy for the kids along with a chance to select a lucky egg worth $100 in cash. Kids can also get their picture taken with the Easter Bunny. Bring your own basket. It all takes place at the Old Cutler Towne Center, 20425 Old Cutler Road. Visit their website at oldcutlertownecenter.com. April 11th, gates open at 6:30 pm, flashlight tour at 7:15 and 7:30, movie starting at 8:00pm. Parents and kids alike will have a great time watching "Frozen"(PG) at Pinecrest Gardens' family movie night. Admission is $5 per person. Fresh popped popcorn, soft drinks, hot dogs, and other snacks are available for purchase. For additional information, visit pinecrestgardens.com. Friday, April 11th through Sunday, April 13th. Visit the Deering Estate as they celebrate the literary, visual and performing arts with readings, concerts and other performances. For more information and a schedule events, visit their website at deeringestate.com. Saturday, April 12th and Sunday, April 13th from 9:30 am to 4:30 pm. This annual event at Fairchild Garden features local foods, plants and butterflies. Enjoy spring brews and summer at their Beer Garden, watch a cooking demonstration, shop for vegetables, herbs, and magnificent homemade foods and much more. The event takes place at Fairchild Gardens. Visit their website for more information. Saturday, April 12th, 10am to 5pm. Bring the kids and spend the day celebrating Spring with egg hunts, face painting, balloon art, wildlife shows, games, arts and crafts and food and gift vendors. $5.00 per person admission. Pinecrest Gardens is located at 11000 Red Road. Visit their website for more information. Saturdays and Sundays only, March 29th – April 13th, 11am till Sunset. Jousting knights, sword fighters, magicians, minstrels and games all await thee at the Renaissance Festival at Cauley Square. Try your hand at archery or knife throwing, or enjoy food ranging from turkey legs, scotch eggs, buns, tankards of ale or cider, kabobs and much more. The event includes a childrens bounce house. For more information, visit cauleysquare.com or ren-fest.com/miami. Sunday, April 6th from 11am to 6pm, at Pinecrest Gardens. This great local event brings food, entertainment and activities together while showcasing student performances. With hands-on activities, exhibits, and fun for the whole family. For more information, visit pinecrest-fl.gov. Tuesday, April 1st, at 7pm. The Concerned Citizens of Cutler Bay will pay tribute to the Fire Fighters of Cutler Ridge Station 34 and Saga Bay Station 55. The guest speaker will be Jay Miranda, Chief Administrative Officer of Jackson South Hospital. The meeting takes place at the Cutler Ridge United Methodist Church, located at the corner of Old Cutler Road and Marlin Drive. For more information, phone Steve Zarzecki at 305-255-4351. Saturday, April 26th is clean up day as thousand of volunteers work to cleanup our shoreline. You too can show your love of the environment by registering to help. The registration deadline is April 4th. Visit the Baynanza website for event details, clean-up sites, details for boat captains, and the full calendar of events. April 4th, 9am. Florida International University's Office of Sustainability is offering a Eco-Rep Certification Course focusing on sustainability in your home, office and community. Admission is $35.00 with lunch provided. Find out more by visiting their website. April 5th, 9am (registration begins 7am.). Put on your running shoes and get moving for a great cause. Participate in either a 5K run/walk or 1-mile walk run/walk benefiting Paws 4 You Rescue, saving dogs from being euthanized. While you're at it, have your dog join you in the fun or borrow one from their “Rent A Dog Booth”. Participants will receive refreshments and a doggy bag, T-shirts and bandannas while supplies last. Registered students can get 4 community service hours. The event takes place at the Palmetto Bay Village Center, 18001 Old Cutler Road. For advance registration, fees, and additional information visit their website at paws4you.org/5k. Saturday, April 5th from 10am to 8pm and Sunday April 6th from 10am to 6pm. Enjoy blues and country music, great BBQ food, and children's activities including pony rides during the Redland Fruit and Spice Park's Blues & BBQ festival. Admission is $8.00, free for children 11 and under. The park is located at 24801 SW 187th Ave., in Homestead. For more information read the press release or visit fruitandspicepark.org. March 30th, 10am – pm. Remember Orchid Jungle? This hiking tour explores the original trail and greenhouses of the old Orchid Jungle property. The adventure then moves to Camp Owaissa Bauer for lunch and a hike through the pine land trail and crawling through the limestone caves. Read more about the hike by visiting castellowhammock.wordpress.com. March 13th – March 30th. It's that time again. Rides, exhibitions, concerts, rides, student exhibits, and lots of food. Don't miss the fun. Visit their website for more information or to order tickets online at thefair.me. On Saturday, March 29th from 8:30pm to 9:30pm. Join millions of people across the world as they turn off their lights for one hour to raise awareness about creating a sustainable world. For more information, visit earthhour.org. Sunday, March 30th from 10am-6pm. Savor delectable fresh seafood at the Deering Estate's Seafood Festival on the Bay. This event features food, entertainment, scenic boat rides, celebrity cooking demonstrations, and an exciting Kids zone. Cost is $25 for adults ($15 if purchased in advance on-line) and $5.00 for Children ages 4-14. The event takes place at the Deering Estate, located at 16701 SW 72nd Ave. For more information, call 305-235-1668 ext. 266, or visit deeringestate.org. Sunday, March 23rd, 10am – 3pm. Vintage cars from 1952 and earlier will be the focus of this 2nd annual event. In addition to the vintage cars, there will be old fashioned lawn games, treats, a scavenger hunt and more. Food and drinks available for purchase. Admission is $12 for adults, and $7 for children 4-14. For more information, visit deeringestate.org. Now through March 23. Miami-Dade Parks and Recreation Department will be accepting applications for their summer staffing needs. Summer jobs include pool managers and lifeguards, park service aides, and recreation leaders. For more information, visit miamidade.gov/parks. Wednesday, March 19th and Thursday, March 20th at 7pm. Miami Dade Public Schools presents the Superintendent's Honors Music Festival. Tickets are only $2.00. The festival takes place at the Cultural Arts Center here in Cutler Bay. To purchase tickets and more information, visit smdcac.org. March 21st, 8:30am - 3pm. The Good Government Initiative will be presenting a “Thinking About Running?” workshop for candidates running for office. Learn how to run an effective and campaign. Space is limited. For registration, costs, and more information, visit goodgov.net. March 17th through March 22nd. Adults 50 and over are invited to compete in a variety of fun events including archery, basketball, bowling, tennis, pickle ball and many others. Registration for the games is required. Competition winners may go on to participate in the state games. For more information, see the following flyers. Senior Games Flyer, Registration Form, Rules and Schedule. Find out more about Pickleball by visiting pickleball.com. Friday, March 14th. Gates open at 6:30 pm; the movie begins at 8pm. Bring the family for an evening of fun beginning with flashlight tours at 7:30 and 7:45. The 8pm movie is “Ice Age: Continental Drift” (PG). Popcorn, soft drinks, hot dogs and other snacks will be available for purchase. Admission is $5.00. For more information, visit pinecrest-fl.gov. Saturday, March 15th 9am to noon. The event begins at 9am with a safety fair, free helmets, Zumba class and bike rodeo. From 10am to 11:30 enjoy the bike ride for all ages, then beginning at 11:30, local sponsor give-aways. The ride begins at Pinecrest Community Center, located at 5855 Killian Drive. For more information, see the flyer or phone 305-995-1334. March 16th, from 1 - 4pm. Scout Peter Rodriguez is giving overseas troops a piece of home to take with them. He purchased 900 pocket flags and is asking for help folding the flags and writing personal notes to accompany them. The project is Sunday, March 16, 1 to 4 pm, at the American Legion Post, 16401 SW 90 Avenue, Palmetto Bay. Questions can be sent to petereagleproject@gmail.com. The above information was written and sent to us by Cutler Bay resident, Hannah Keime. Councilmember Peggy Bell recently distributed a “town” newsletter in which she copied and pasted many items from our website. We wanted to ensure that our readers understand that it was Councilmember Bell who took this information from us, without our permission, not the other way around. For those who have asked, “no”, Councilmember Bell has not contacted us to offer an apology, or explanation. Thursday, March 6th, 2pm – 4pm. The Town of Cutler Bay will be holding a grand re-opening of Old Cutler Road. The event takes place at Health South located at 20601 Old Cutler Road. For more information, see the flyer. Friday, March 7th. The movie begins at 8pm, happy hour begins at 6:30pm. Pinecrest Gardens presents “The Birdcage” (R). Come early to enjoy a stroll through the gardens or a glass of wine. For more information, visit pinecrest-fl.gov. Pinecrest Gardens is located at 11000 Red Road. March 7th-9th, from 9:30am – 4:30pm. This event features more than 10,000 orchids, walking tours, workshops, great food and entertainment. Fairchild Garden is located at 10901 Old Cutler Road. For more information, visit fairchildgarden.org. March 8th, 10am to 6pm and March 9th from 10am to 5pm. Enjoy a day of fine chocolates, and cheese paired with beer, wine and spirits. Watch liver cooking and chocolate making demonstrations, along with rap music, and over 80 vendors. Tickets are $15 in advance; $20 at the door. The event takes place at Pinecrest Gardens located at 11000 Red Road, in Pinecrest. For more information, visit pinecrest-fl.gov. The Town of Cutler Bay is a participant in the State of Florida's Communities of a Lifetime initiative. Participating towns plan and implement improvements that benefit both young and elderly residents. To that end, the town recently conducted a survey of residents 55 and older. Read the assessment and the final report. The Town has created a helpful flyer about the do's and don'ts of driving through roundabouts. March 1st and 2nd from 10am-5pm. This annual festival features Asian crafts, art, exotic music and dance, as well as authentic Far Eastern cuisine. Admission is $10 for adults, children children 11 and under free. The Redland Fruit and Spice Park is located at 24801 SW 187th Ave., in Homestead. For more information, visit fruitandspicepark.org. March 2nd, from noon-6pm. The Rotary Club invites you to enjoy the best chicken wings, burgers and BBQ in all of South Florida. Shop local vendors, or let your kids have fun in the childrens play area. While you are there, buy a ticket for a chance to win a Golf Cart or Harley. Admission is $10 per carload, or $5 if you walk or bike in. Proceeds from the event will help support the service initiatives of the Rotary Club of Perrine-Cutler Bay/Palmetto Bay. For more information about the event, visit the Facebook event page. Tuesday, March 4th, 7pm at the Cutler Ridge United Methodist Church, 20740 Old Cutler Road. The Concerned Citizens of Cutler Bay will be hosting Cutler Bay Town Manager Ralph Casals and Cutler Bay Director of Public Works Alfredo Quintero as featured guests. The status of ongoing construction projects in the Town, including the Caribbean Boulevard improvement project, will be presented along with the development of the Town’s Flood Mitigation Plan. February 28th, 7pm. Join your friends and neighbors for a free viewing of the movie "Despicable Me 2" at Cutler Ridge Park. The park is located at 10100 SW 200th Street. See the flyer for more information. Campaign Workshop By "The Good Government Initiative"
March 1st, 8:30am - 3pm. The Good Government Initiative will be presenting a workshop "Campaigns Done Right" for candidates running for office. Learn how to run an effective and ethical campaign. For more information, visit goodgov.net. Saturday, March 1st, 10am to 2pm. Surrender your exotic pet or talk to an expert about being a responsible pet owner. The event takes place at Zoo Miami. For more information, visit miamimetrozoo.com. Friday, February 21st, movie begins at 8pm, happy hour begins at 6:30. Pinecrest Gardens presents "Monty Python's the Meaning of Life" (R). Come early to enjoy a stroll through the gardens or a glass of wine. For more information, visit pinecrest-fl.gov. Pinecrest Gardens is located at 11000 Red Road, in Pinecrest. Friday February 21st 6-11pm, Saturday February 22nd 1 to 11pm, Sunday February 23rd 1 -10pm. Carnival rides, food truck vendors, salsa classes, live bands, art exhibits. The Carnival will be held at Holy Rosary-Saint Richard School, 18455 Franjo Rd. Admission is Free. For more information, visit hrsrcarnival.com. February 22–23rd from 10am – 6pm, with extended hours to 8pm on Saturday at the night stage and beer garden. This event features 153 artists, food court, beer garden and jazz. The event takes place in the area of 5750 SW 72nd Street. For additional information, visit southmiamiartfest.org. Sunday, February 23rd from 11am to 6pm.. Enjoy music by the Road Kings, food from local restaurants, and more. Admission is $5.00 entrance fee at the gate, or free if you pick up tickets beforehand at participating local restaurants. Find out more at tasteofthebay.org. February 26th from 6:30 – 8pm. East Ridge Retirement Village will be having a forum to learn more about County Commission District 8 candidates Lynda Bell and Daniella Levine Cava. Both candidates have declared their intent to run in the August 26th Primary Election. The qualifying period has yet to open, so additional candidates may come forward prior to the June 17th deadline. East Ridge Village is located at 19301 SW 87th Ave. in Cutler Bay. Have you, a friend, or a family member considered running for a seat on the Cutler Bay town council? The 2014 elections may be months away, but the race for office often starts at the beginning of a new year. If you have considered running for office, now is the time to begin planning your campaign. Elections will take place in November for the position of Mayor, District Seat 1, and Seat 3. The formal qualifying period begins July 25th and ends August 8th, but waiting to start campaigning may put you at a disadvantage. For information about what you need to do to run for a seat on the Cutler Bay council and when you can open your campaign account and begin campaigning, speak with the town clerk and visit the town's election page at cutlerbay-fl.gov/elections. See a breakdown of salary and benefits that councilmembers receive. Tuesday, February 4th at 7pm, at Cutler Ridge United Methodist Church, 20740 Old Cutler Road. This month the Concerned Citizens of Cutler Bay will host the Cutler Bay Police Department's Neighborhood Resource Unit (NRU) for a presentation of safety tips, crime statistics, recent news, and other subjects of interest. Saturday, February 8th, noon to 5pm. Enjoy live music, good food, line dancing, mechanical bull rides, children's activities, beer and much more. General Admission is $5.00. For more information, visit pinecrest-fl.gov. Pinecrest Gardens is located at 11000 Red Road. Tuesday, February 14th, visit the Deering Estate for a romantic concert under the stars on the edge of Biscayne Bay. The concert features jazz vocalist, Nicole Henry. The gate opens at 7pm and the concert begins at 8pm. Tickets are $20. Guests can bring blankets, lawn chairs, & picnic baskets. Refreshment and food may also be purchased, in advance, for an additional fee. For more information, call 305-235-1668 ext. 233. or visit deeringestate.org. Join the fun as Homestead celebrate a rodeo tradition going back 65 years. Lots of events beginning Wednesday, January 22nd through Sunday, January 26th. For the full schedule of events including the Mechanical Bull "Buck Off" Competition, Family Night, Rodeo Parade, and the Rodeo itself, visit their website at homesteadrodeo.com. Wednesday, January 22nd at 7pm. This Free event features Dr. John Withey, Assistant Professor, FIU Department of Biological Sciences. Dr. Withey will discuss the ecological value that parks and reserves provide birds and visitors and how better design can create urban environments benefiting both human and natural systems. For more information, phone 305-919-6000 or visit. January 24th and January 25th at 8pm, January 26th at 3pm. Three actors take on all 37 Shakespearean plays in 97 minutes. This comedic performance takes place at Pinecrest Gardens. For admission prices and additional information, visit pinecrest-fl.gov. Pinecrest Gardens is located at 11000 Red Road. Friday, January 24th through Sunday, January 26th , from 9:30am until 4:30pm. Visit Fairchild Garden for their 8th Annual International Chocolate Festival. This event will feature chocolate treats, cooking demonstrations, informative lectures, and tree sales. The event takes place at Fairchild Tropical Gardens, located at 10901 Old Cutler Rd. For more information, visit fairchildgarden.org or call 305-667-1651 ext. 3344. Saturday, January 25th, 8pm, and Sunday, January 26th at 3pm and 7:30pm. The Deering Estate kicks off it's new Theatre Space with a "One-Minute Play Festival" featuring one minute plays by over 30 South Florida playwrights. For more information, deeringestate.com. January, 20th. Admission to both Everglades National Park and Dry Tortugas National Park is FREE on Martin Luther King Jr. Day. To find out more, visit nps.gov. Mondays and Wednesdays, 7pm to 8pm. Looking for an intense cardio workout combining dance, kickboxing and step to popular music? Bokwa Fitness Classes are being offered at Cutler Ridge Park. The cost is $5.00 per class. The park is located at 10100 SW 200th Street. For more information, read the flyer. Students entering the ninth, tenth or eleventh grade are encouraged to apply for admission to Cutler Bay's local Public High School, Cutler Bay Academy. Cutler Bay Academy offers innovative learning programs including iPrep Academy, COAST and Liberal Arts Academies. Applications will be accepted until January 15th. For more information about how to apply, visit their website at bayacademy.org. Saturday, January 11th, 2:00pm-2:00am. Twelve hours of live music with over 30 bands on multiple stages, arts & crafts, bounce house, and great good and drink specials. Family friendly entertainment until 10 pm, adults 21 and over from 10pm to 2am. $5.00 cover, kids under 12 free. The fun takes place at the Cutler Bay Sports Bar, located at 20305 Old Cutler Rd. For more information, visit cutlerbaymusicandartfestival.com, facebook.com, or call 305-303-3976. January 11th and 12th, from 10am-5pm. Visit Pinecrest Gardens for their Fine Arts Festival. This juried art show features original art from national and international artists. There will be live music, great food and a "Little Sprouts Zone" for the kids. Free admission for all. For more information, including overflow parking areas, visit pinecrest-fl.gov. January 11th and 12th, from 10am-5pm. Visit the Redland Fruit and Spice Park for this annual festival featuring historic displays, arts and crafts, tropical plants, and food. Children's activities include pony rides, Everglades reptile show and a petting zoo. Admission is $8.00 for adults, Children 11 and under are free. Redland Fruit and Spice Park is located at 24801 S.W. 187th Avenue, in Homestead. Visit their Facebook page, Phone 305-247-5727 or visit fruitandspicepark.org for more information. Saturday, January 18th. Starting time is at 10-1 am with the event ending at 5pm. An event for car enthusiasts, history buffs and those who enjoys a leisurely drive through rural South Miami-Dade County. Participants start at Cauley Square, located at US-1 and 224 Street. The event moves on to other Homestead destinations ending at Schnebly Redland's Winery where participants receive free entrance to the Saturday Night winery event with live music, refreshments and food. The cost is $10.00 per car at the event. For more information, visit redlandriot.com. Recycle your Christmas tree by taking it to the Eureka Drive Trash and Recycling Center located at 9401 SW 184th Street. The center is open seven days a week, from 7am to 5:30 pm. Trees must be free of stands, lights, ornaments, tinsel and all other decorations. The trees will be converted into mulch which will be available at the Eureka Drive Center beginning in mid-January. Residents who do not wish to recycle their tree may place it at their curbside no later than Tuesday, January 7th. Trees may also be cut into smaller pieces and placed into your green colored waste cart for collection. For more information visit miamidade.gov. Saturday, January 4th, at Cutler Ridge Park from 11am to 3pm. Cutler Bay will be holding their 5th Annual Chili cook-off with prizes awarded for the best chili, salsa and corn bread in Cutler Bay. Chili tastings and entertainment for the whole family. To participate in the contest or for more information, contact Fred Bobson at 305-238-4166 and read the flyer. Cutler Ridge Park is located at 10100 SW 200th Street (map). Tuesday, January 7th from 7-9pm. The Concerned Citizens of Cutler Bay will have their first meeting of the year. This month's meeting will include elections of new officers. Current President, Steve Zarzecki has decided to not seek reelection. If you are interested in becoming a member or running for a position on the board, please attend this very important meeting. The meeting takes place at Cutler Ridge United Methodist Church, 20740 Old Cutler Road. A news article in the Monday Miami Herald falsely reported that a double homicide took place in Cutler Bay. The shooting took place at approximately 159th ST and 103rd PL, far from our community. The Herald has been notified of their failure to accurately report this news story. Multiple night event beginning on Wednesday, November 27th, from 6pm - 9pm. Visit Pinecrest Gardens for a magical night of Christmas Carols, musical theater performances, story telling, and more. General admission is $5.00. Visit pinecrest-fl.gov for a list of nights the event is taking place and additional information.